The Wall Street Journal is reporting that RIM could be announcing their answer to the iPad at a developer's conference next week. The code named "BlackPad" will not run RIM's just released BlackBerry OS 6, instead it will run an OS that was created by a company that RIM recently purchased. The tablet is expected to ship in Q4 of this year, feature a seven-inch touchscreen, Bluetooth, broadband connections, AND will need a BlackBerry to access cellular networks. The last feature, or lack thereof, is reminiscent of Palm's Foleo, and that's not a good thing. It's been 3 years since I and 74 other people tested the Foleo for Palm. 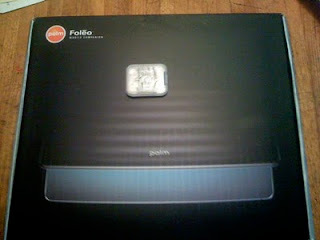 The picture above is the Foleo on my kitchen table (complete with the box Palm was going to ship the Foleo in). 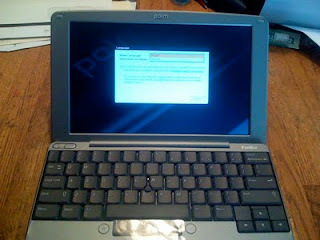 The Foleo had a lot of potential (it was the original netbook). It was instant on (no bootup), it was slim, light, good battery life, had a comfortable keyboard that you could easily type on, had both Bluetooth and WiFi on board, ran a Linux OS, Opera web browser, Documents To Go, and the nail in the coffin of what would kill the Foleo. You needed a Palm Treo in order to use the email application on the Foleo (I was able to get a few non-Palm Windows Mobile smartphones to work with the Foleo, but it wasn't going to be supported out of the box). The email application on the Foleo synced with the email app on your Treo. It wasn't a "real" mail app. No Treo, no mail. You could easily use the built in Opera web browser connected via WiFi to get to web mail (.Mac in my case), but why negate potential Foleo buyers because of its dependence on Palm's golden child, the Treo? I was very vocal with Palm about this issue, it made no sense. The Foleo was very capable and did not need to rely on a Treo for one of--if not the most-- important functions people use on mobile devices, email. It was created to work that way to insure that for every Foleo sold a Treo had to be part of the equation. In my opinion, as well as those of other testers, this wouldn't fly with consumers. I have also used a Palm Foleo, and agree with Mr. Geddes' views and opinions about RIM's upcoming BlackBerry tablet. Even if RIM doesn't require users to own a BlackBerry for email and Internet access from the "BlackPad", RIM will also have another potential risk that Palm also had: Having to support multiple operating systems; BlackBerry OS and the BlackPad OS. The similarities between Palm's Foleo and RIM's "BlackPad" are striking. Let's hope RIM doesn't make the same mistakes that Palm did when developing the Foleo.